Hmm. Welcome to the job, I think to myself as I wandered from my new desk down barely familiar hallways to the new boss’ office. I was just here yesterday – but that first day was a bit of a blur. At least I was shown where the break room and rest rooms were. For my Fluid Exchange Breaks, said Bob, my assigned buddy for the day. It’s January and cold outside – and I am here at 7 am to meet with my boss first thing before she starts her own Product Team meeting – which was to last all morning. The windows are outlined with little drifts of snow. Some of the holiday decorations have yet to be taken down. People smile at me as I walk the halls and I overhear them asking each other about their holiday break as more people slowly start arriving. I hope every day doesn’t start this early – although it is one way to beat the New Jersey morning rush-hour traffic. I knock on the doorway frame of the open door and enter as the new boss waves me in as she wraps up a phone call. As I sit she hangs up and welcomes me. After some pleasantries and we quickly revisit things we discussed during the interview process such as my prior jobs experience and education as if she is double checking her memory banks. And then she asks about my prior day – the day for HR paperwork that I came in for specifically for. It was a long morning, sloughing through all the piles of paperwork that the HR rep had me complete yesterday, prior to this, the first real day on the job. Then the boss shifts gears and starts talking about my development…what they sometimes call “ramp up” she says. She outlines the process for what she says will be the next 30 to 45 days. Depending on seat availability she says. Heard that before. She tells me that I will start the development process by watching a 12 minute video that is intended to demystify the entire development process – a process that is intended to bring me fully on board. She adds that after that video there would be several modules for me to complete yet this morning – modules that I would access via my computer, followed by some in booklet form that would require me to conduct some one-on-one interviews with several of my departmental team members, other Product Planners and Managers, several of my cross-functional product team members from other parts of the organization, and that I would both start and complete those by interviewing her. Sandwiching is what I think she called it. She then hands me a handwritten list of modules numbers on a form that she says I should take as someone new to the firm. They are all online. I see that the URL is printed on the form, so I decide not to ask any questions. She continues – after I think first checking me out as to my comfort level about me conducting interviews with others and with her. Hey, I just got done running that interview gauntlet to get this job – and this time it would be me asking the questions. I’m very OK with that. I think. She tells me it’s after that first series of training modules that she and I would sit down and develop the rest of my development plan…the learning path forward. And that we would do that at lunch today – which she expected to be a late lunch – but not too late – as she expected her meeting to run over just a little bit. Again she tells me that the video would demystify all of this – but that I should check back in with her secretary if I had any questions before launching into it all. She hands me a two saddle-stitched documents, glossy brochure looking things, that she says are those first modules to be completed yet this morning after I view the online modules. “Any questions so far?” she asks. I nod no, as I quickly flip the pages of that first booklet, labeled Module 1051 and its table of contents. These are not the first modules on my development path, but here they are in my hands. I really wanted to check them out and get going with getting up to speed. “Don’t forget to start with that video,” she reminds me. “And then there are those online modules to take first before you jump into these” she almost scolds me. I think I had indeed started to read the first page of the first document – and I guess she didn’t want me to go there quite yet. First things first. So I head back to my desk to watch that 12 minute video. OK. Lots of learning headed my way. But first I stop in the break room for coffee and I notice this poster – right near the coffee pot. Dang! It’s the path forward. 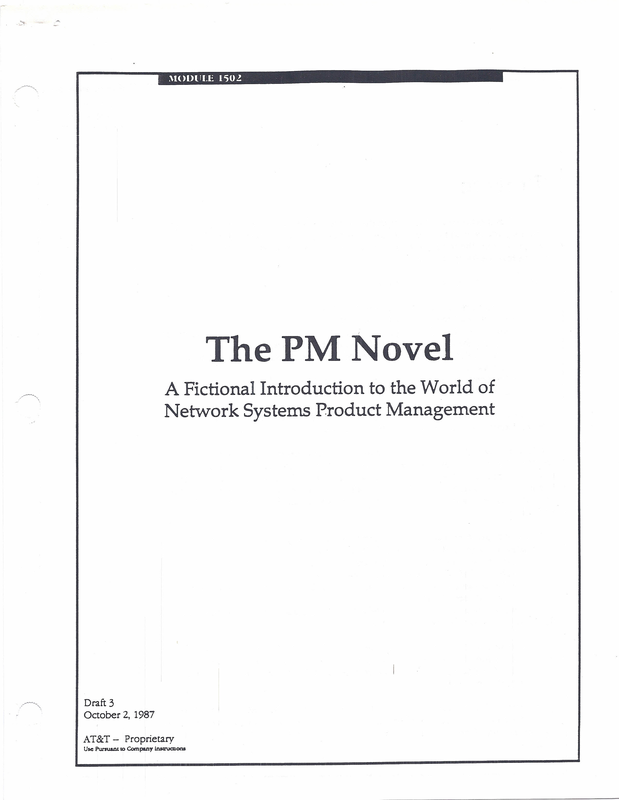 It reads Network Systems Product Management Curriculum. 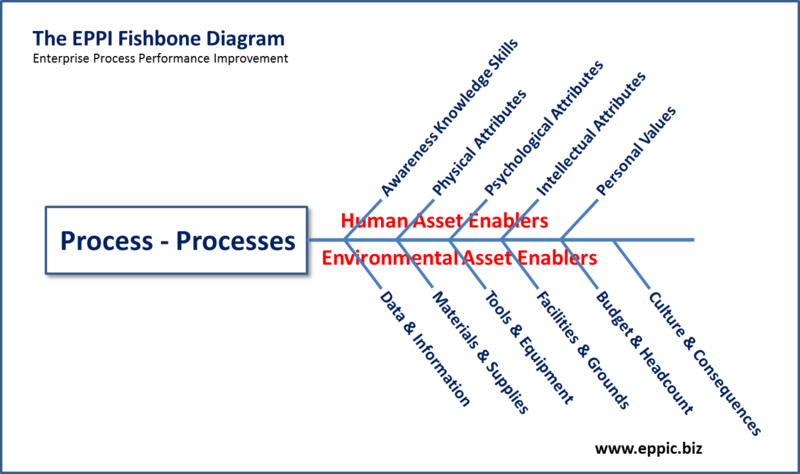 I notice that the first blue blocks in the top left are exactly the first “building blocks of learning” as my manager called them that I needed to complete this morning. I do a quick count and note that there are 58 blue boxes in the 1000 Series. Yikes! Will I ever have time to do the job? Looks as if I’ll be spending the next few weeks in training mode. Well wait a minute now. Upon closer inspection they all seem to be short modules, chunks I’ve heard them called by others. 15 minutes most of them read. All except that last one in the 1000 Series. And that’s 8 days in length. Is that a typo!?! Well at least I only have 5 online modules and 2 booklet modules to do before meeting with the boss again – after that video – to further demystify the organization and the job, and then to lay out the rest of my development plan. On to the video. Back to my cubical. I was really intrigued now. Just as I sit down at my desk my phone rings. It’s the boss. She’s enrolled me in that 8-day course and it starts in 2 weeks. In Atlanta. Now I have to complete all of the appropriate modules in the 1000 Series of that Product Managers Curriculum – and we haven’t even sat down yet to figure out which of those 57 modules is appropriate before I get to number 58. Whoa! The video is a short 12 minutes. It moved fairly quickly. What I got out of it is that the Curriculum is very flexible as it was built for those of us in Product Management from several Business Units within Network Systems, which is a part of AT&T. I decide to jump on those online modules after refreshing my coffee. 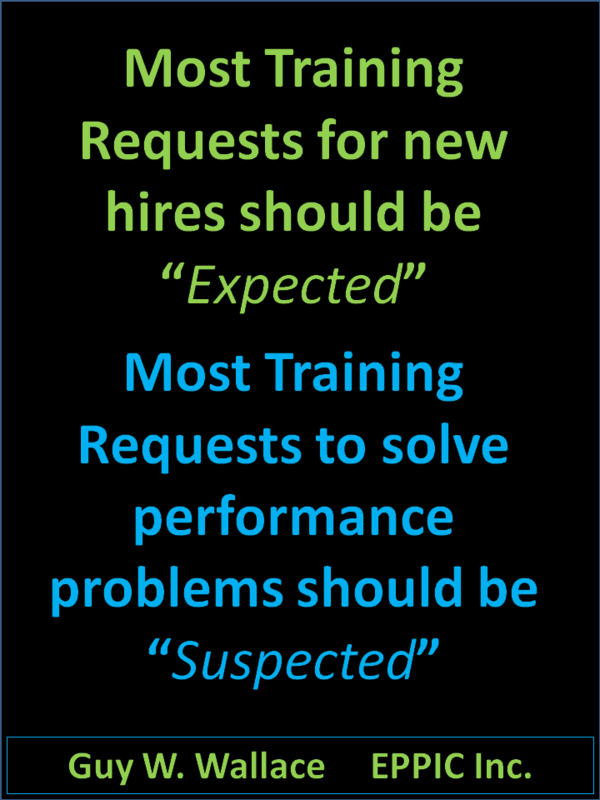 I will probably need some caffeine to keep me awake – if these chunks of training are like others that I’ve experienced in prior jobs. Yawners. This is not my first rodeo as they say. Back in the break room I run into Bob again, my buddy from yesterday who was also on one of the interview panels that I had met with, back in early December. He recognizes me right away and walks over with his hand out. We shake hands as he welcomes me back and asks me how is my second day one going. We both walk over to the coffee urn and he gestures for me to fill up first. When I finish I notice he is scanning that Curriculum poster on the wall. He turns his head to me and notices that now I am scanning it too. “It looks like a lot to cover – and quickly,” I say. “You’ll be glad you had this upfront,” was his retort, not taking his eyes off the poster. “I was here two years before they brought this out. Nothing made any sense in my job for two whole years. I felt I was drowning in a sea of ambiguity. I simply couldn’t figure out what my next steps were. I was theoretically running product team meetings that were really being run by our teammates from The Labs. I felt as if I was simply their errand boy, their clerk. It wasn’t until I did the 8-day course that I saw it all much differently. And that changed everything.” He was tapping on the poster – right on that last blue box at the bottom of the left column. “I’m going to that in two weeks,” I said. “Lucky you. It’ll be the hardest training session you’ll ever go to, but the most worthwhile,” he said, very straight-faced. “Gotta run. I’m off to Boston and then Denver for the next two weeks. Why don’t we catch up after you’ve completed this course.” I’m one row over and in the back corner from your cube. “Yes,” I said. He shook my hand and then exited the room. I turned back to the poster on the wall and re-read it, backward this time, from the bottom up. I was wondering what led up to this 8-day course that itself was going to be so tough. The video had actually shown me all of that – but now I was determined to go watch that video one more time before launching into the online modules. And take some notes. I guess looking back on it now I was more than a little intimidated by his comments. Hardest training session, huh? OK, I’m up for that. I went back and spent rest of the morning of my first full day in the new job watching that video again, taking notes, and then reading the online modules which covered the company, my division, my business unit, and the job of a Product Planner/Manager. I felt like a little cog in the gears of some complicated machinery. The next step was to complete before my late lunch was to finish the two modules in booklet form. 1051 and 1052. I opened 1051 up knowing it was Ok to start that now. That was good. Great overview. But it still left me with a lot of questions. But it was that last module that I completed before the late lunch that began to clear up the mystery. Kind of. It was module 1052, called the PM Novel, and it covered a year in the life of some Product Managers and their boss. This was one big, complicated company. Over 250,000 products were offered to their customers here in the US and globally. There were potentially eight functions or areas to the job of a Product Manager. Mine might involve all 8 for some of my products and less for other products. Products could be anywhere in their life cycle. I was shocked when I finished that PM Novel. 100 pages read in just a couple of hours. According to this fictitious year in the life of the main characters, my job would involve working with a cross functional team of folks from The Labs, Finance, Marketing, Engineering, Manufacturing, Distribution, Sales and Service. Plus at times folks from Legal, Contracting, HR, and several other organizations would participate, as needed, in our Product Team meetings. And while there would always be a core team of people on our Product Team, others, including others from other Product Teams would come and go depending on where in the life cycle our products were. A grouping of products was sometimes called a Product family, but not always. And almost all of our Products were part of one or more systems of products. I was guessing that it was like being the battery product manager and dealing with the alternator and engine product teams from time to time. Oh, and the brakes people. When the boss showed up for our late lunch we sat in my cubical and talked about what I had learned to that point. I had a lot of questions. When I exhausted all of the questions that I could think of – I was swimming – but it felt more like swimming downstream than upstream, she backed up us to the beginning. She talked about my key products and where they were in their life cycles. Not all were actively managed although they were part of our P&L, Profit and Loss Statement, our financials. She talked about my team and my role in running that team, collaboratively. I was going to be responsible for all 8 of the PM functions, and that most of the work would involve dealing with the very big entities that was Network Systems through their representatives on my team. 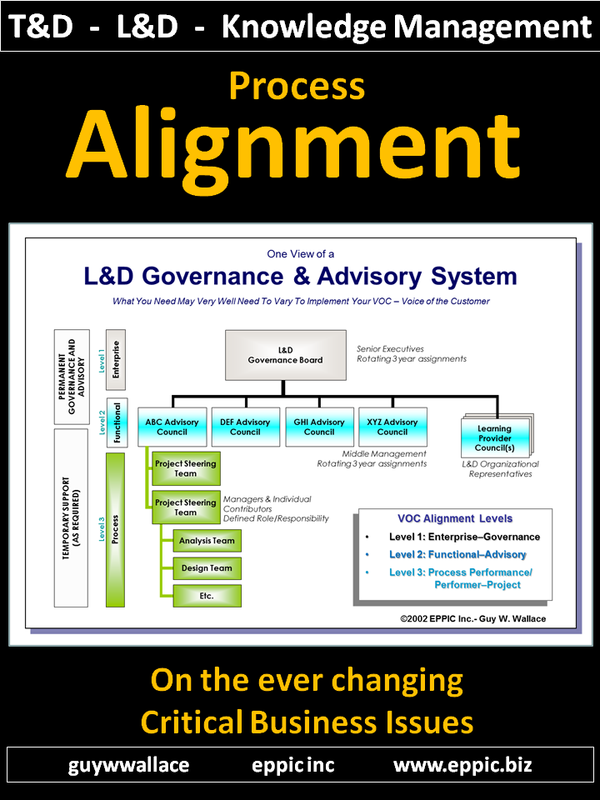 Just as I represented my Product Management organization – so too would they, reprsent their organizations. Just as we brought our goals, resources and constraints to the table at each meeting, so would they. At one point she went silent. I think she was waiting for me to say something, ask something. But I couldn’t. I needed to absorb it all for a moment. It was all beginning to make sense a little, but the new clarity was causing more questions to rush into my mind. She grabbed my coat and handed it to me and we walked over to her office where she grabbed hers and led me to the stairs and then out the door to the parking lot. I was thankful for the quiet time, some thinking time. As we drove down the street she pointed out some historic buildings and before long we pulled into the parking lot of a restaurant. Not many cars in this lot, I said. Yes. I deliberately choose for us to come to after their lunchtime rush hour. So we could continue our talk, our debriefing on what you’ve uncovered about the world of Network Systems Product Management. Those were the words right out of the video that I had watch twice this morning. Was it only this morning? That first meeting this morning with her seemed now as if it had been a few days earlier, not just hours. We chit chatted about life, family, sports and ordered when the waitress showed up. We ate and continued our casual conversation. When the waitress cleared our plates the boss ordered coffee and following her lead so did I. She then pulled out 2 glossy brochures out of her oversized purse and handed them to me. 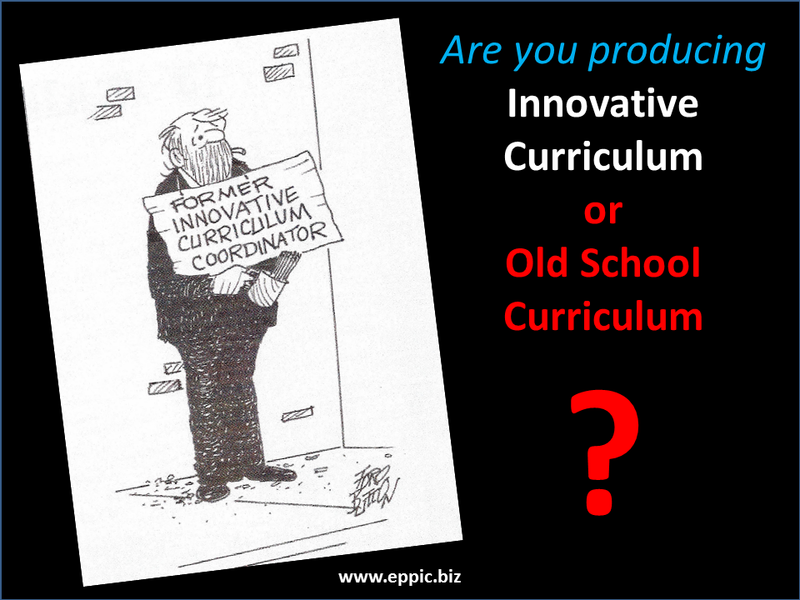 Looking at their covers I immediately recognized these as additional modules from the Curriculum. 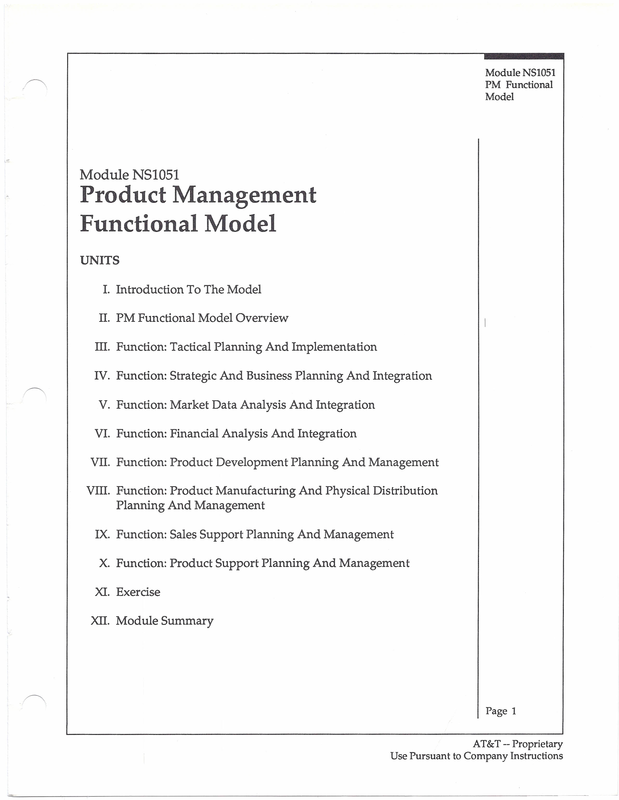 I had just read the first two of the four in the 1050s series – Module 1051 which provided a fairly detailed overview of the PM Functional model in Module 1051, and then that PM Novel, Module 1052. We spent the rest of the afternoon in that quiet restaurant and walked through both Modules. 1053 and 1054. 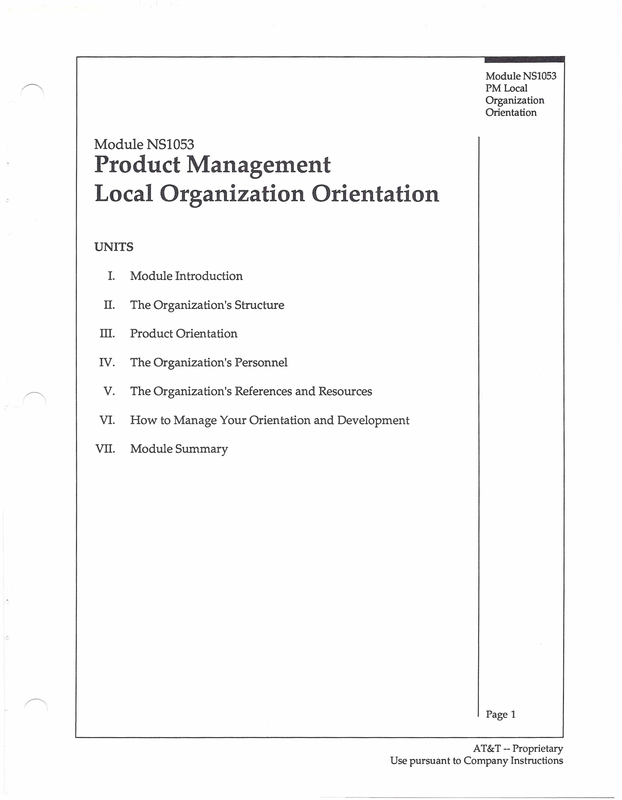 Modules 1053 titled: “Product Management – Local Organization Orientation” was where the entire organization that I had joined was explained to me. Customized, because last quarter it was different. The Module had lots of places for me to take notes – and I did not require any encouragement to do so. I drew the current organization chart by hand, as outlined by my boss in response to the questions this module was prompting me to ask. OK. the answers are different from time to time, but the questions were not, I surmised. OK. This is cool. My interview guide. Not that I didn’t think of additional probing questions as one thing led to another. And I asked most of them, deciding as the formed into my consciousness that they would be better left to a later day. I would be coming back to this as I did the other interviews with others from inside and outside my new organization. The boss said that this wasn’t exactly how it was supposed to be done – doing 1054 before fully completing 1053 – and the dozen or so structured interviews I would conduct and take not of – but given her travel schedule this was our window of opportunity. “It’s now, or much later,” she said. And now, is a better alternative. 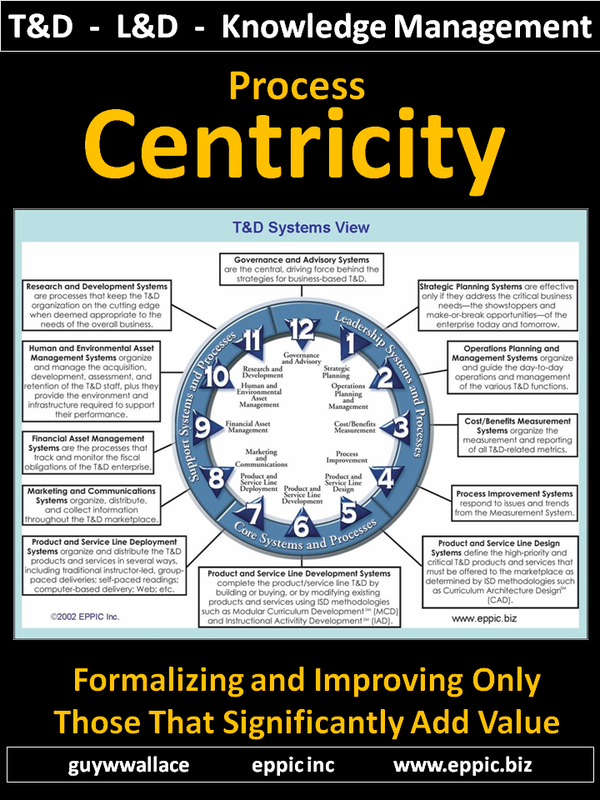 Then we tackled Module 1054 which was titled: “Product Management Job Orientation” – which walked through those 8 functions of a PM job and what the expectations were for me, very specifically. Again I found myself taking notes in the 11×17 fold out pages inside this learning tool. Someone had figured out what data and information I needed to capture in a logical manner. Wow. This was pretty cool. Now I understood why these answers weren’t in any of the published content online. These were highly volatile. Like the joke response to what’s your process? Well, what day is it, Wednesday? Then it’s the Wednesday Process. Different day, different process. Out of control. Or so it might seem, unless you know how to read it, that complexity. 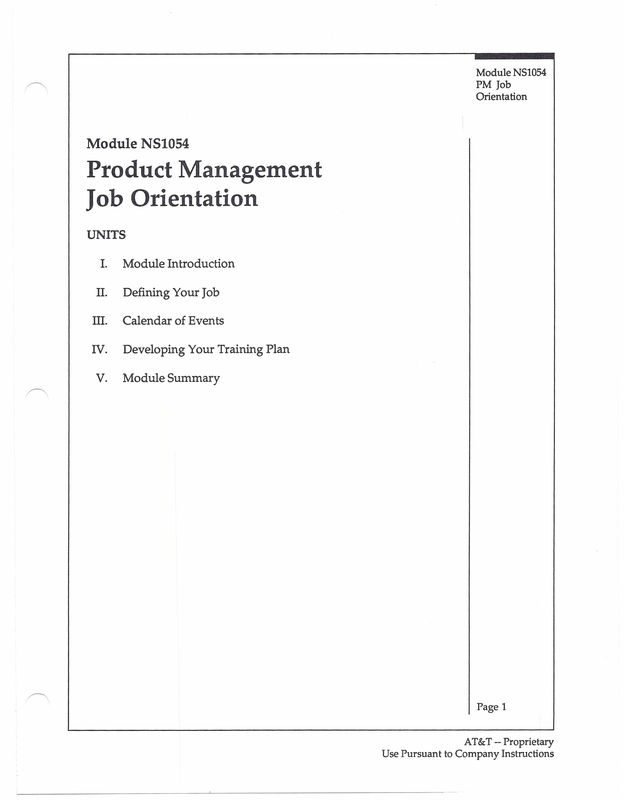 That 1054 module also included developing my detailed Training Plan for everything in the later portions of the series of self-paced modules, leading up to and including that 8-day group-paced course: Module 1251: Product Management Process Training – Basic Skills. Almost everything on that plan, on that path, were very short modules. And we skipped more than we planned for. The boss explained that those were for others in other business units. As there were over 1100 of us in this job category across 5 business units – and many had come from within the business, there was both variation in the needs of individuals, and in the content packaging. Developing that Training Plan was a collaborative effort. That was the first time that both of those things have ever happened to me before, having a unique development plan – and developing it collaboratively with my boss. Most of the time I was given a plan that I had no input to, if I was given a plan at all. This was going to be different. Very different. I was on-board, and on-my-way. January 1988. This was going to be a good year. A really good year. I could tell already. Back to the break room. Not for more coffee. I had to know. Right away. What were the module titles in that 2000 series? 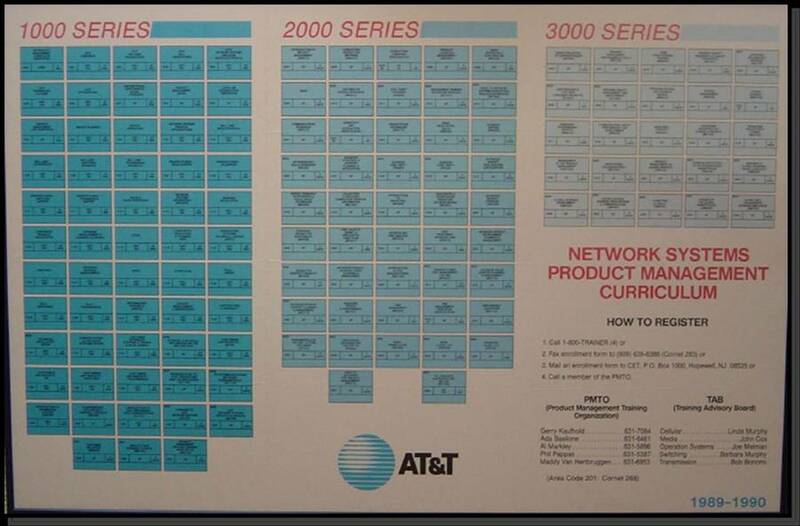 Note: The PM Curriculum Architecture effort for AT&T Network Systems (the old Western Electric – part of Ma Bell as AT&T was known before it’s breakup) was completed in late 1986 and the NS 1050 Series and other front-end modules were completed by mid 1987. The NS 1251 module – the 8-day course – was successfully piloted in October of 1987. Guy Wallace, who didn’t do delivery work, made an exception (he was enticed by more CAD and development work by this client) and went on to serve this client by delivering that 8-day course 31 times including 5 times in The Netherlands, between 1988 and 1994. My client (O.Wayne Stewart) gave me permission to use the poster, video and portions of these modules for my marketing efforts. He said, strategic partners do things like that. He was one of my best clients over those 8 years (1986-1994). 2nd Note: there are many other Blog Posts on this project effort – which won an award for its ROI from NSPI back in 1989. Search on this site using “NS1251” and “Product Management” as your search terms. 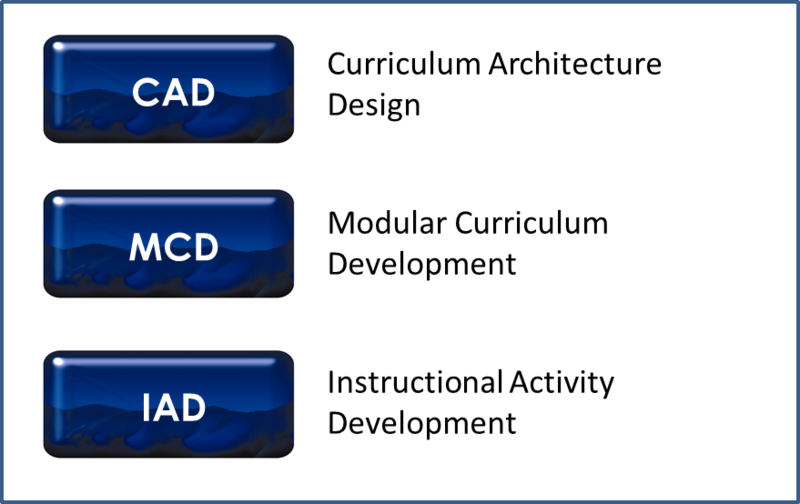 3rd Note: Guy will be presenting on CAD – Curriculum Architecture Design – at Training 2012 in Atlanta – on Wednesday February 15, 2012 at 8:30 to 9:30 am. 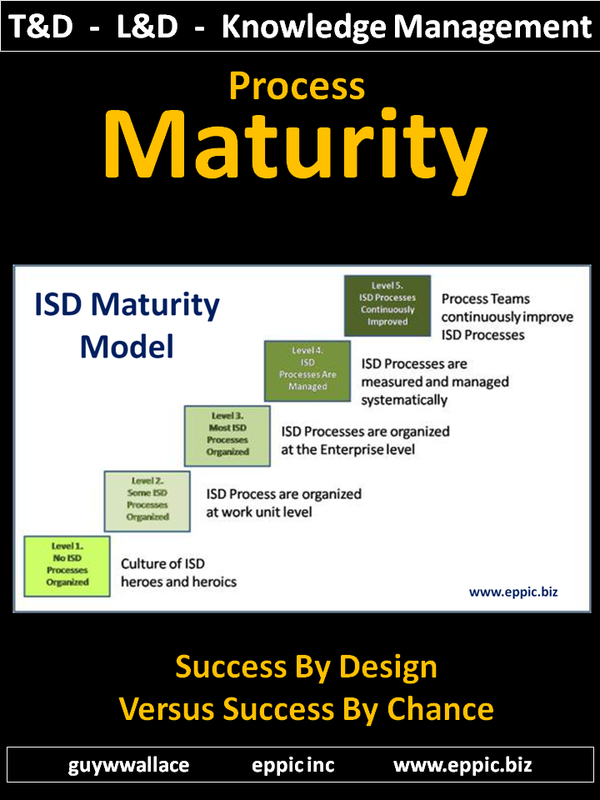 His first presentation on the ISD methodology that led to this project’s approach, was in April, 1985. The first article, was this Training Magazine, in September of 1984. Guy has done 75 of these CAD to date (as of January 2016) and many MCD efforts.. Guy W Wallace – CAD History – April 2014.